Click here to see a current price list, as well as helpful information on preparing your quilt for longarm quilting. Browse through the longarm quilting patterns you can choose from for your quilt. Additional patterns are available on the pattern designer websites and can be purchased for around $15 each. Located in Melbourne, Florida, Sew Finished LLC provides affordable longarm quilting services, quality workmanship, and service with a smile. I can load backing fabric up to 122” wide on my longarm frame. Backing length is unlimited. In order to keep my quilting backlog manageable, to keep my prices down, and to turn quilts around faster, I do not do Custom Quilting. 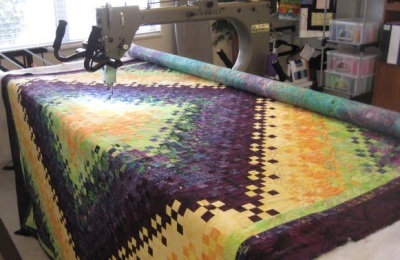 However, I can provide a list of longarm quilters in the area who do Custom Quilting. Please note that tipping is not necessary, or expected.